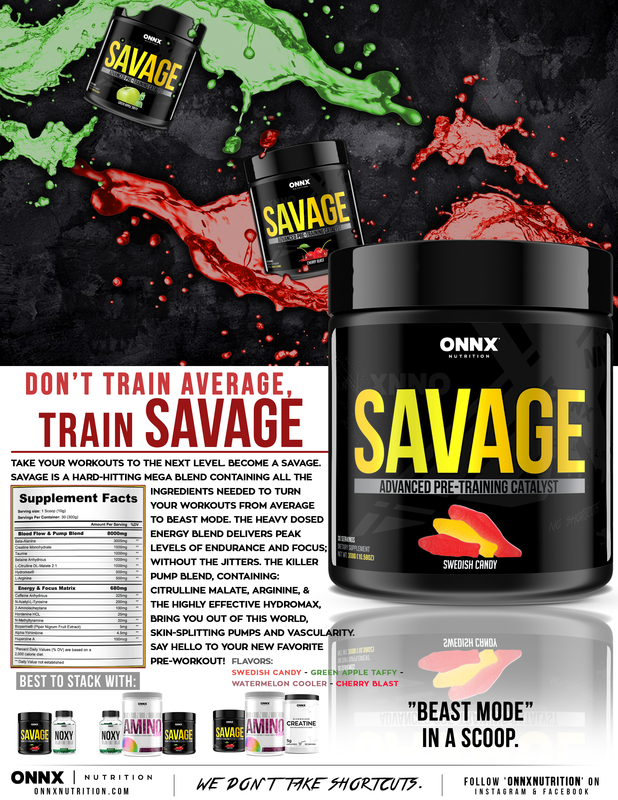 Savage is a hard-hitting mega blend containing all the ingredients needed to turn your workouts from average to BEAST MODE. The 8g Energy Blend delivers massive endurance and focus; without the jitters or 'cracked out' feeling. Along with the Pump Blend, containing Citrulline Malate, Arginine, and the highly effect HydroMax; your pumps and vascularity will be out of this world. Best pre i've ever taken hands down. Stacked with noxypump my workouts are insane! I normally don't leave reviews but this product deserves it. The savage hits hard but not TOO HARD to where you feel sick. I stacked it with the NOXY and have had some of the best workouts of my life. STRONGLY RECOMMEND! I like stronger pre workouts but can't stand most of them that give me the jitters and cold sweats. Savage hits hard but it's more of a smooth clean energy. Love this sh**!!! Awesome pre. I take the savage for both my lifting and my fasted cardio sessions. on my fourth can now and still am feeling just 1 scoop! Love the Savage! My endurance/pumps are on point and doesn't give me the cracked out effect. If your looking for a great pre Try this one out gives you a great pump and great focus! Plus the flavor is so good! First time trying this product and am thoroughly impressed!